ARM is targeting mid-range smartphones and tablets priced between US$200 and $350 with a new low-power Cortex-A12 processor the company announced Monday at the Computex trade show in Taiwan. The company’s processors are used in most of the world’s smartphones and tablets. The new Cortex-A12 processor design will succeed the Cortex-A9 design, which was used in Apple’s iPhone 4S, Samsung’s Galaxy S3 and many Android tablets. The A12 will come with up to four cores, and the first handsets and tablets with the processor will be out in late 2014 or early 2015, said James Bruce, lead mobile strategist at ARM. ARM’s chief marketing officer Ian Drew at a Computex press conference Monday. ARM is seeing fast growth in mid-range mobile devices with prices above $200, with handset shipments expected to touch around 500 million by the end of 2015, Bruce said. With A12, ARM hopes to address that emerging market. The A12 is a faster and more power-efficient replacement for Cortex-A9, which is now a five-year-old design, Bruce said. It is 40 percent more power efficient than A9, and up to 30 percent faster. That translates to better performance and longer battery life in tablets and smartphones. “There’s a group of people who want the leading edge features of smartphones, but don’t have the budget to reach the $400 to $450 price,” Bruce said. ARM will have to contend with Intel, which is aggressively chasing the low-cost tablet market with its upcoming Atom chips code-named Bay Trail, which is based on the Silvermont core. Intel expects Android tablets running Bay Trail to be introduced later this year priced between $200 and $399. The mid-range smartphones and tablets with A12 will be aided by the right system-level tools like graphics processors and software development kits, said Ian Drew, chief marketing officer with ARM, during a press conference at Computex in Taipei on Monday. For one, the A12 will be optimized for mid-range devices with the Android OS, which is being used on tablets and smartphones, Drew said. “We see this market being significantly larger than PCs,” he added. With the A12, ARM improved its single-threaded capabilities, said Patrick Moorhead, president and principal analyst at Moorhead Insights and Strategy, in an email. ARM licenses its processor designs to companies like Qualcomm, Nvidia, Apple and Samsung, who then make chips for mobile devices. ARM did not announce any licensees for Cortex-A12. On performance, the A12 is a notch below Cortex-A15, which is for high-end smartphones, tablets and servers. Samsung’s latest Exynos 5 chips in the Nexus 10 tablet and Galaxy S4 smartphone are based on the Cortex-A15 processor. The A12 however borrows some features from the A15 chip. It is based on a similar processor core and has virtualization support, but the overall A12 size is smaller, Bruce said. The processor could also be used in Windows RT tablets as the design has the hooks to support the OS, Bruce said. ARM processors are also being used on an experimental basis in servers. The 32-bit A12 does not have features desirable in servers such as error correction and 64-bit compatibility. Applications in servers are now moving over to 64-bit addressing, which allows for systems to have more memory and storage. “I don’t see people using it in servers,” Bruce said. ARM offers other processor designs such as Cortex-A7, which is for handsets and tablets priced under $200. The A12 can be combined with A7 in ARM’s Big.Little chip design, where low-power cores are mixed with high-performance cores for efficient energy use of chips. The A12 will take on demanding applications such as multimedia, leaving mundane tasks like text message and voice calls to the A7 processor. Beyond A12, ARM’s next big processor release will be its first 64-bit processors, with chips due starting next year for smartphones, tablets, PCs and servers. The A12 will be 40 percent faster, but less power efficient than the low-end 64-bit processor called Cortex-A53, which will be used in chips starting next year, Bruce said. The Cortex-A53 will succeed the A7. Chips with Cortex A12 will be made using the 28-nm manufacturing process and later on the 20-nm process. Bruce did not say whether chips with A12 processors will be made using 3D design, in which transistors are stacked on each other to reduce leakage and boost performance. ARM also announced the Mali T622 graphics processor, which can be paired with the A12 processor in smartphones. The T622 can render high-definition video and has built-in image stabilization features. 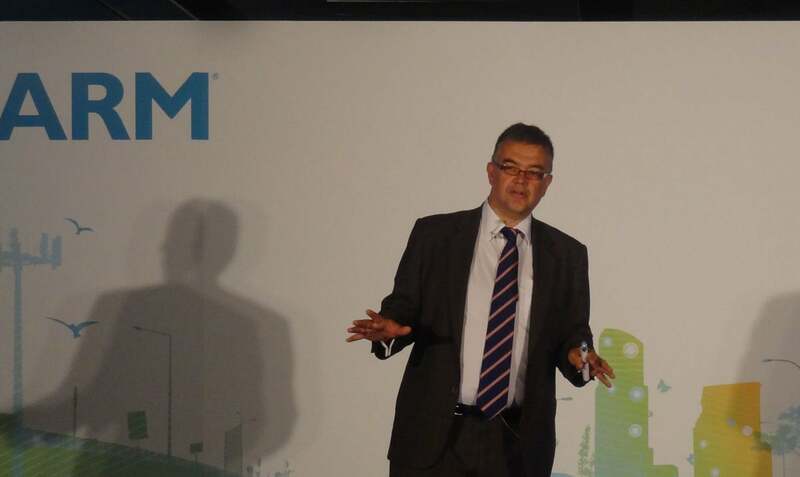 ARM also announced the Mali V500 video accelerator to speed up HD video encoding and decoding. People will be editing and changing video on the fly and a powerful processor is needed for that, Drew said. “What it requires is system-level performance, not just a good CPU,” Drew said. That’s where the Mali products come into play, as they will be optimized for smartphones and tablets, Drew said.